Consisting of the Hebrew letters ?hey? and ?yud?, these two letters literally mean ?living?. Related to the Hebrew word for life ?chaim?, this word is featured prominently in the saying ?Am Y'israel Chai!? (The nation of Israel lives!) 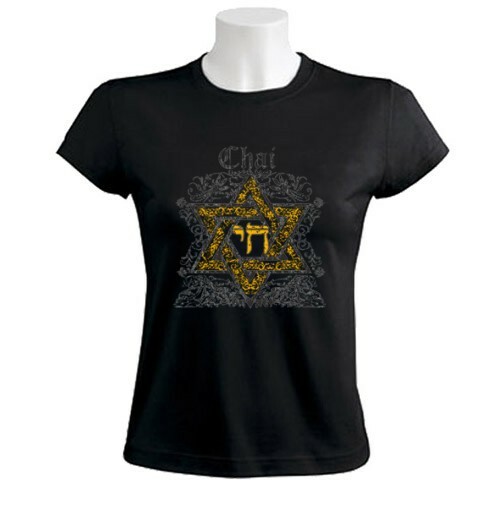 Our stunning black and gold Jewish ?Chai? t-shirt has a vintage design with it's floral motif and a large intricately designed Magen David, also known as the Star of David, with the ?Chai? symbol placed beautifully in the middle of it all! Print colors are grey and gold. For a unique and exclusive Hebrew t-shirt, our vintage print is sure to become one of your most prized possessions! Our t-shirts are made of 100% cotton and are long lasting with bright colors. Our products are all designed and printed in Israel.